A distinguished leader and highly respected advocate for human rights, Michael Posner, has contributed extensively to the cause throughout his career. Former Assistant Secretary of State for the Bureau of Democracy, Human Rights and Labor at the State Department, Posner helped establish the Fair Labor Association (FLA), an organization that strives to improve working conditions in the apparel industry through collaborative efforts and dialogue with corporations, universities and NGOs. 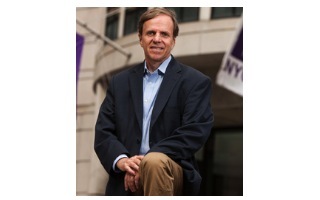 In 2013, Michael Posner joined New York University’s Stern School of Business, as Professor of Business and Society, to launch the first-ever Center for Business and Human Rights. This center will serve as resource tool for students to teach them the value of human rights in business, and will also work as a facility for public education and advocacy. In this interview with Boston Global Forum (BGF), Michael Posner talks about the genesis and growth of the FLA, the need for collaborative effort from companies and governments to impact human rights issues, the urgency to educate consumers about their products and the definition of ‘sustainability’ in business. BGF: What were some of the challenges you faced when setting up the Fair Labor Association (FLA) in the 1990s? Did you get a lot of support from companies or did you have to work hard to motivate them? Over time, trust grew among the group and participants stayed at the table. We spent a year-and-a-half defining standards for working conditions in the apparel industry and developing a methodology for implementing an agreement on standards. During this period, Guess Jeans and Kathie Lee (representing Wal-Mart) dropped out of the group. The unions, too, dropped out after an intense internal fight. At the end of the day, the American Federation of Labor and Unite Union made a judgment that they couldn’t support an agreement that made it easier for companies to go to China and places where union activity was restricted. Even without these companies and unions, there was enough trust and confidence in what we had developed that we were able to launch the Fair Labor Association in 1999. BGF: Why do you think companies dropped out? Is it just about profits and about the money that it takes to enforce worker safety standards or does it stem from larger issues like a fear of responsibility or obligation? Michael: It’s more complicated than that. On the one hand, there are issues of brand reputation. It’s easier for a highly brand-sensitive company like Nike or Adidas to devote resources to improving working conditions than it is for a company like Wal-Mart that competes on the basis of low prices. Many companies think about these issues in terms of reputational risk and mitigating the potential of ending up on the front page for producing products using sweatshop or child labor. On the other hand, companies are also thinking about these issues in terms of business sustainability. Companies in the manufacturing sector need a reliable supply chain that can produce quality products on schedule and to their design specifications. Decent working conditions and factory safety undergird the sustainability of this system. The premise of the FLA is that no company can successfully address these issues acting alone. Companies facing common human rights challenges in the same industry will be more successful if they work collectively. In many ways, this is the hardest part because these companies are fierce competitors and they’re not comfortable disclosing their vulnerabilities to others in the same industry. Despite the discomfort, many companies have recognized that they need critical mass to make a difference and have found ways to work together. BGF: Do you think that companies in the west have enough power to yield immediate influence in poor countries like Bangladesh, where political and social reform might take several years to come about, if at all? Michael: These are a big, seemingly intractable problems. Bangladesh is an exceedingly poor country that took advantage of trade quotas in the 1970s by quickly building up infrastructure to produce high volumes of garments very cheaply. While Bangladesh is the world’s second largest producer of readymade garments, it remains a very weak state and there is little enforcement of safety or labor regulations in the garment sector. In the long term, a stronger national government with the capacity and inclination to regulate its domestic industries is the obvious solution to protecting workers’ rights and enhancing workplace safety. But as you say, that kind of reform will take years and even decades. In the mean time, there is a governance gap. It’s tempting to say that big Western multinationals can fill that gap on their own. But the reality is that while the brands are a very important player, they cannot do it alone. In the short- to medium-term, enhancing working conditions in Bangladesh will require action by the brands, the government, the local manufacturers’ association, Bangladeshi and international civil society, Western governments, the ILO, and the international financial institutions. The larger fundamental issue is how do you think about a sourcing model that allows global brands and local manufacturers to grow their profits while ensuring worker safety, well-being and dignity. BGF: What advice do you have for Boston Global Forum, a non-profit based in the US? Shall we focus on consumer education or government policy or something completely different? Michael: I think the answer is all of the above. You’ll have to decide where you have a unique capacity to make a difference. I know Governor Dukakis has thought about statutory regulation in the United States focused on business and human rights. I don’t know if that’s politically possible, but it’s certainly the way issues like corruption have been dealt with. Another aspect that is very important is the consumer piece. Consumers have a difficult time differentiating among companies and understanding what their choices are when it comes to ethically produced products. There’s a lot of work to be done there. Third, there needs to be a broader discussion of what ‘sustainability’ means. When many companies talk about sustainability, they’re really talking about environmental concerns. That’s a very narrow understanding of sustainability. In my mind, sustainability encompasses not only the environment, but human rights, labor rights, and development. There needs to be a broader frame and a group like Boston Global Forum can play a role in identifying those companies that are willing to think more broadly about business sustainability over the long-term.